We are pleased to announce that the initial feedback from Palliare has been positive. Below are a few comments from readers and trainers. Palliare is available for purchase as an eBook or in print, or can be downloaded as a pdf for free. Thank you for sending the Palliative Care Volunteer Handbooks. It is a valuable resource and I have distributed a copy to every volunteer. The content is excellent and underpins our training model based on Palliative Care Victoria. Received the copies of Palliare. What an excellent resource. Very much appreciated. Thank you. Just wanted to say a big thank you to you and everyone involved in bringing out the Palliative Care handbook for volunteers. What a wonderful resource this book is, I am really looking forward to sharing this book with all our palliative care volunteers who are always interested in improving and gaining knowledge to help the clients, families and friends who they are visiting on behalf of (our service). I would like to congratulate you on the wonderful presentation and quality of the book it will be a book we will be using often. 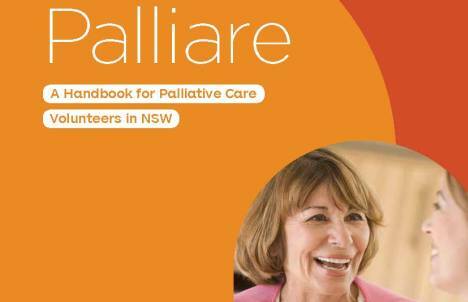 I really found Palliare to be an incredibly useful resource and training tool, and had the foundational information required for training Palliative Care volunteers. I tabbed the sections I wanted to specifically refer to in the training session and as each volunteer had their own copy, they could highlight or write in it as they saw fit. Each volunteer also really appreciated their own copy, as they could go home and do further reading on topics we discussed. The chapters prompted interaction and discussion from the group, which is vital in making learning relevant and interesting. I thought the inclusions in each chapter were comprehensive, and the wording was pitched at an appropriate level. References for further reading were great. I just wanted to let you know that I’ve been reading the Palliare booklet you gave us. It is so well written and has great information in it. I can use that knowledge, not only as a volunteer but as a busy Mum and with my husband having health issues from his (work context). I appreciate learning about the self-care especially as it is something that I need to keep a check on when I am busy.